Feral defects and Sunspot disappears as X-Force battles the MLF. As Cable battles Reignfire, Feral escapes with Gyrich, who needles her along the way. Elsewhere, X-Force turns the tide against the MLF. 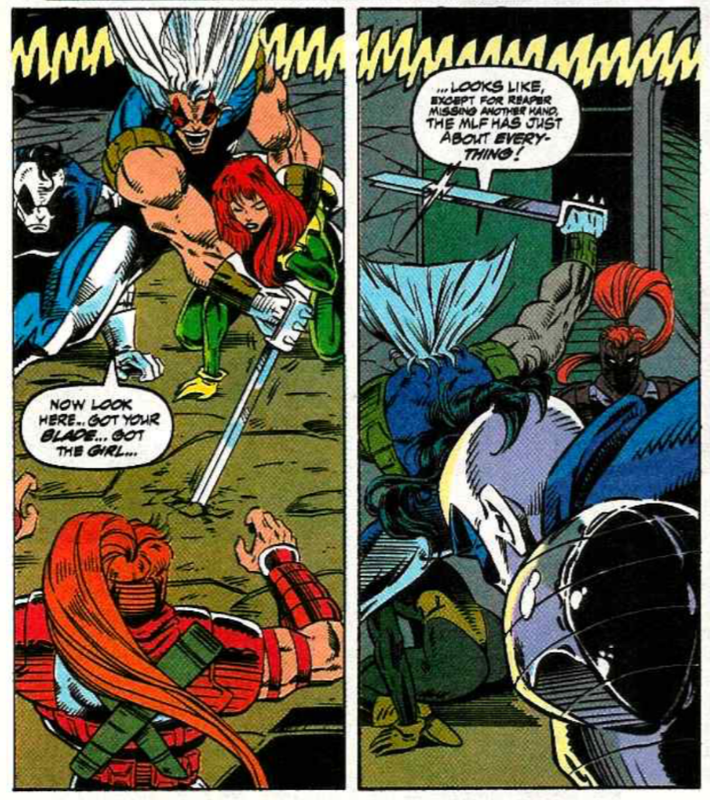 As Feral & Gyrich make a break for X-Force's ship, Feral finally snaps, and turns on Gyrich, but Tempo stops her from killing him. As the larger fight spills outside, Cable is forced to stun Feral, who is retrieved by Reignfire as he calls for the group, sans Tempo, to retreat. 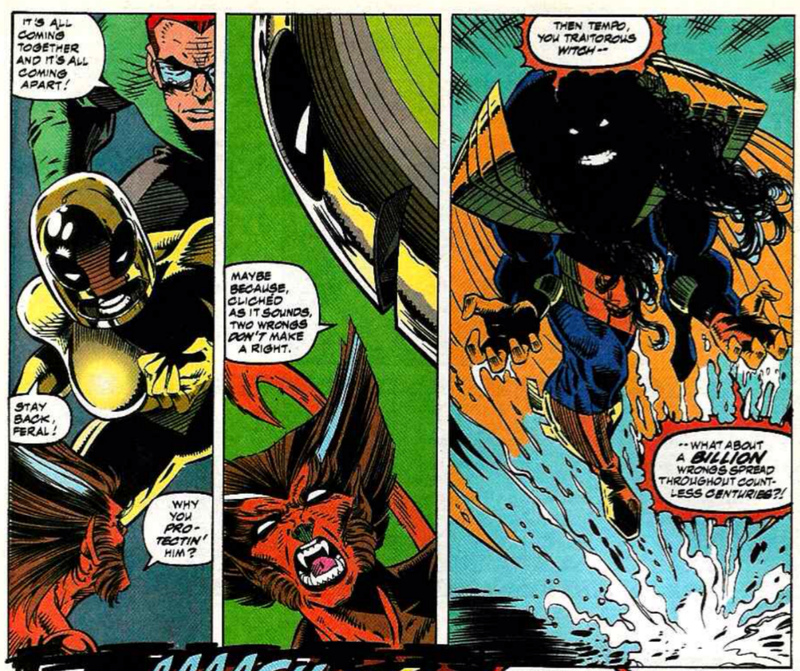 But as Locus prepares the teleport the MLF away, Sunspot uses his power to fly up and blast her, causing feedback which disrupts the teleport, sending the MLF, and Sunspot, to parts unknown. 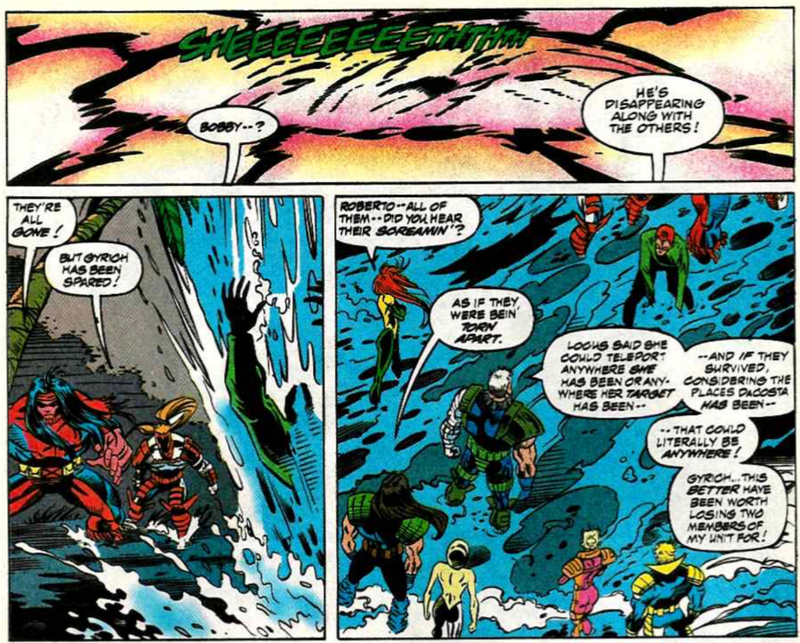 Back on the island, Gyrich insists his views on mutants haven't changed, causing Cable to slug him, angry that all their sacrifices that day had been for nothing. Tony (here Antonio) Daniel, the series new regular penciler, makes his debut this issue after drawing the series' second annual. He'll stick around through the first half of the book's "Age of Apocalypse" alternate title His work here seems a little rougher than in the annual (and while it's very rudimentary and not terribly good, I still like it better than his contemporary work). This issue marks a pair of departures from the series. First, Sunspot disappears as the MLF escapes, getting caught up with Locus as she teleports away. This ultimately is the setup for his transformation into Reignfire, as it will eventually be established that he and Locus end up in the future as a result of their confrontation here, and Sunspot will be absent from the book until after "Age of Apocalypse". 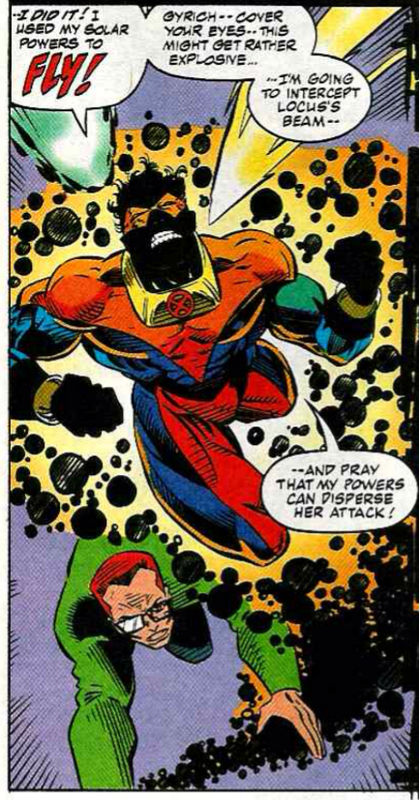 Secondly, Feral quits the team and throws in with the MLF, fed up with putting her life on the line to protect Gyrich (who does a tremendous job of needling Feral throughout the issue). Though she'll appear again here and there through the years (including a two-part story that explores more of her past about a year from now, and Jeph Loeb's stupid "all animalistic mutants are related" story in Wolverine), this effectively marks the end of Feral as a significant, ongoing character. Sunspot gets tangled up with Locus thanks to utilizing his powers to fly for the first time, a manifestation of his power that will stick around after his return. 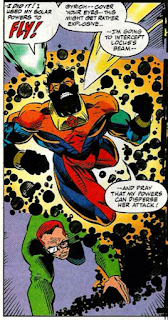 Tempo, long established as the most conflicted (and arguably characterized) member of the MLF, breaks with the team this issue, helping save Gyrich and staying behind as the rest of the group escapes. It's revealed here that Reaper lost another hand to Shatterstar last issue (something that wasn't clear last issue), continuing the running gag of Reaper losing limbs during fights with X-Force. Shatterstar uses his rarely displayed mutant power (noting that he rarely displays it) this issue. Boomer's abusive father also gets referenced. 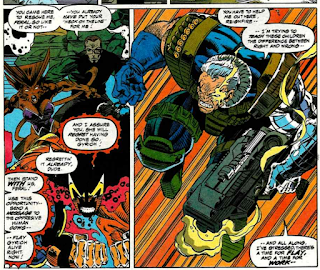 Cable is surprised to learn that Reignfire knows his (full) name. The credits of this issue feature Stan Lee presenting a litany of acronyms describing the story. 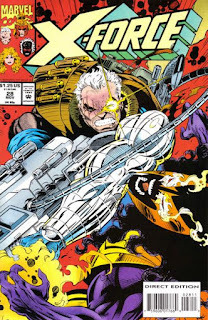 After Reignfire urges Feral to flay Gyrich, Cable chastizes him, saying he's trying to teach X-Force there's a time for work and a time for flay. 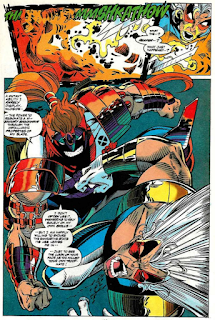 Nicieza uses the conclusion of X-Force's first battle with the new Mutant Liberation Front to shakeup the roster further, writing out both Sunspot and Feral in the process. The former will be back before too long (with his depature here ultimately part of a longer storyline Nicieza is developing), but this effectively marks the end of Feral as an ongoing presence in the series. As such, it can be read as another way Nicieza is chipping away at the series' Liefeldian roots and transistioning it into more of a New Mutants legacy title. Outside of Shatterstar, Feral is arguably the most Liefeldian character left in the series, and while Shatterstar's ties to the Mojoverse and Longshot give him a connection to the larger X-universe, Feral's past as a Morlock hasn't been relevant since the early issues of this series, leaving her as little more than a parody of early 90s trends (Cable, of course, has already been stretched beyond his Liefeldian origins, a process that will only continue). Having her defect to the Mutant Liberation Front not only strengthens the rivalry between the two teams, but immediately injects Feral with an added layer of complexity: no longer is she just the one-dimensional Wolverine clone chafing to cut loose, now she's the fallen teammate taken up with the team's mortal enemies, the one member of the team for which X-Force wasn't extreme enough, the soldier who decided she'd rather be fighting for the other side. That it also means readers won't have to deal with her as much moving forward is just an added bonus. Tomorrow, "Fatal Attractions" concludes in Excalibur #71. Next week, X-Men Unlimited #3 and Avengers West Coast #101. The way Gyrich was needling Feral, it was almost as if he had a bet with someone that he could manage to get himself killed by an evil mutant to prove a point. Maybe it was Robert Kelly. I mean, honestly, he was being such a jackass, if Cable had turned around and shot him, would anyone have blamed him? I wasn't particularly sad to see Feral go, but the way she went just felt so ham handed and forced. 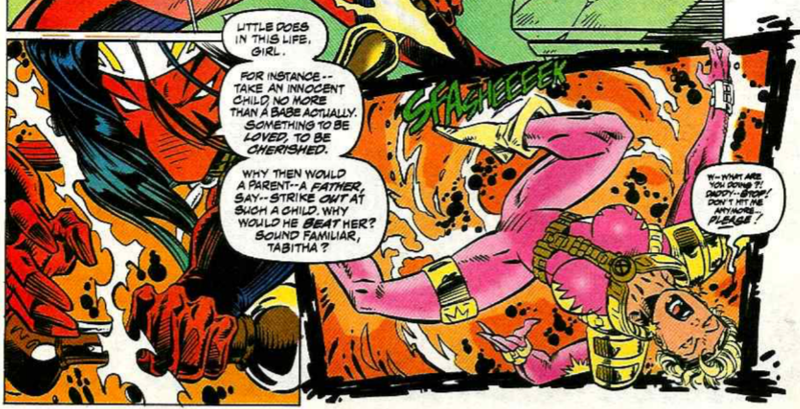 It was as if Fabian Nicieza had meant to write a long term plot about Feral and her turn, didn't really get around to it, but went ahead with it and said "Nailed it" when he was done. The point of the scenes with Feral was that contrary to what everyone assumed, Thornn was really the good sister and Feral was really the evil sister that murdered their family. Of course, Gyrich was an idiot for not waiting to reveal this until after everyone was safe but arguably being an idiot isn't out of character for him. I actually liked the Feral plot. Unlike Colossus, she was Really Evil All Along. @Jack: I also don't need to point out that we'd just gone through this with Colossus, so it doesn't even get points for originality. Huh. I'd never really thought of Feral's departure in terms of Colossus'. 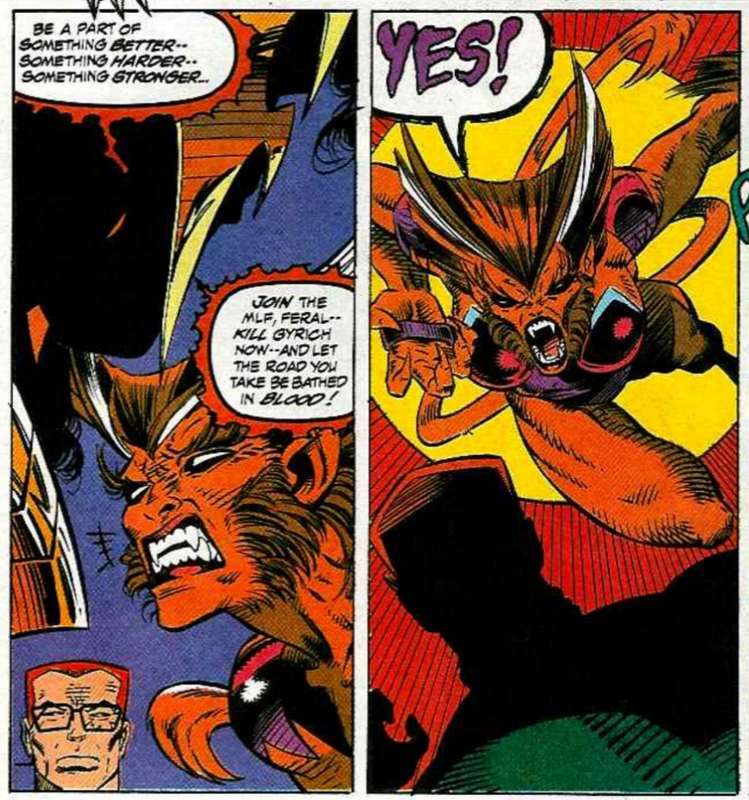 Probably because the former left because he was pissed off at Xavier, while Feral left because she was too evil. But you're not wrong that they're essentially the same plot device. But Nicieza does get a decent story out of this development, as Anonymous mentions, a few issues down the road, and I find "Feral the failed soldier" far more interesting than "Feral, the pseudo-Wolverine who just wants to slash stuff all the time). For the most part, it does. This story isn't terrible, and "Child's Play" has its problems but does at least closeout the Upstarts business. There's a good issue where Professor/Ship gets a body coming up, and that two-parter that deals with Feral and Thorrn is solid. (At least based on my memory; I haven't read this particular era of the series in awhile, so we'll see if it holds up as well as I remember). My relationship to ’90s X-stuff is perfectly encapsulated by the struggle I’m having with your description of Feral as “significant”. Well, "significant" to this series, in that she's a founding member and has been around for every issue up to this point. Certainly not very significant outside of this one title. I acquired this issue along with about three others from random titles in one of those Toys R Us pack-ins. Not being a regular follower of X-Force, I really dug it. For whatever reason, I hated seeing Sunspot written out even though I had no real attachment to the character. The art makes it look as though Reaper was blown apart, and Shatterstar sure seems to back that up when he decks Wildside. Yet he will be one of the central characters of the upcoming Exiles series (alongside Sienna Blaze and Juggernaut) as part of the relaunched Ultraverse imprint following Marvel's purchase of Malibu. The events of those books are largely ignored, but the characters eventually found their way back to the Marvel U proper. Such a weird footnote for a c-list character at best. On that note, Shatterstar REMOTELY channeling an energy blast through his sword seems... dubious. But Rule of Cool and all. Anyway. Enjoyable action-heavy story with the requisite Pyrrhic victory and a nice debut for Tony Daniel, whose work I've really taken a liking to over the years. I read this issue SO MUCH back in the day, and the one thing I remember most is that it was the book finally getting rid of Feral, who'd been little more than a nuisance for ages. She never added anything to the storylines, never had significant things to say, was openly hostile (and even LETHAL!) to her teammates, and to 13-year-old me, had the NERVE to not be an attractive female! So she was by far my least favorite member of the team, and I considered this a mercy-killing for her character. Reaper's continued injuries at the hands of X-Force are amusing, as always. The disrespect given him, Wildside and Forearm in this issue is quite bizarre, and seems to be Nicieza backlashing against Liefeld forcing him to write all of these silly characters. It's particularly notable because the MLF used to be a group of nearly TWENTY PEOPLE, and by this point was four returning characters, two newbies, and Reignfire. I call them "Sketchpad Characters" because there's really nothing to any of them but Liefeld sketching them out on a pad before it's time to draw the issue, and nothing more to them other than that. What's funny is that I actually enjoyed this era of the book... but I'd stopped reading so soon afterwards that I never saw the full backstory or Feral, nor Sunspot's return, neither of which were that far away!